CJ raced at Jefferson County Kennel Club at 77lbs until retiring in 2005 at 3 years old. He was in one home for a few years then was an economy return and was adopted a second time by the Aguilar family in 2010 when he was 7 years old. 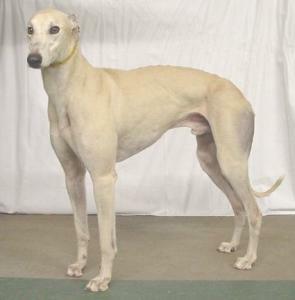 CJ is an unusual light fawn color that is nearly white. He was a big, sweet, affectionate boy with a great, laid back personality and just loved people in general. He loved for anyone to scratch his big head and back, and even seemed tp smile. His favorite part of the day is taking an evening walk. When he heared the leash rattle, he came running and started jumping up and down. He was the lead dog in the pack, but he was a gentle leader who rarely asserted himself. CJ also enjoyed playing with his stuffy toys, but only when one of his people played with him. He was a well-balanced and well behaved boy who was a great family member. He was great with kids and small dogs but chasing cats was something he enjoyed just a little too much.